Cannabis became fully legal in Canada today (Oct. 17), and that's just one big reason to know the top weed stocks to watch in October 2018. Up to eight U.S. states will vote on ballot measures related to marijuana this fall. New Jersey's legislature is also considering legalizing the plant. New Jersey will be the second largest state to legalize weed after California. Cannabis is quickly becoming legal in the United States via state vote or legislative action. By 2021, legal marijuana could become a powerhouse industry, worth a whopping $24.5 billion in the U.S. alone. That's more than the double the current value of the legal marijuana industry. You see, legalization leads to more people buying cannabis; more companies growing, distributing it, and selling it; and more companies experimenting with the medical benefits of cannabis. 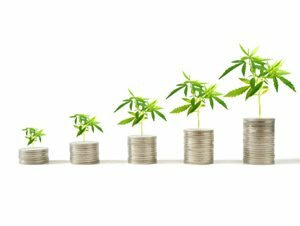 Legalized marijuana could be an explosive catalyst, and we're bringing you the top cannabis stocks to watch in October to help you cash in. United Kingdom–based pharmaceutical manufacturer GW Pharmaceuticals Plc. (NASDAQ: GWPH) targets the development of marijuana-based experimental drugs for specific conditions in its business. GW's Epidiolex drug is focused on treatment for two rare forms of epilepsy. Researchers at GW are currently investigating its use for two other conditions that cause seizures. In late June 2018, the U.S. Food and Drug Administration (FDA) approved Epidiolex for patients with Dravet Syndrome and Lennox-Gastaut Syndrome. The approval was the first time the FDA had approved a drug that used a cannabis-derived substance. Money Morning Defense and Tech Specialist Michael A. Robinson forecasts that Epidiolex could generate revenue of up to $1.7 billion by 2026. GWPH is currently trading at $151.72, up 13% on the year. But analysts are projecting gains of over 50% over just the next year alone.